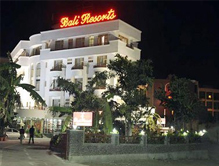 Hotel Bali Resorts have all the facilities that are required to pamper the guests. With their well trained staff it is for sure that you will have a delightful stay. The hotel is located on the Reasi Road which is close to the Katra bus stand. Apart from the spacious rooms and vibrant dining option, they also have an ayurveda centre where you can replenish yourself after the tiresome Vaishnodevi Trek. 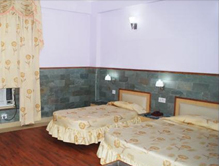 The hotel is an ideal choice for accommodation in Katra for the leisure and pilgrim travelers in Katra. The entire design of the hotel is contemporary that creates a magic to distress when mixed with the salubrious environment of mystic Katra city. Accommodation There are 42 rooms decked with all the latest and necessary facilities that make your stay a lot relaxing. There are options of Deluxe, Super Deluxe, Family Suite, Double Bed AC, Double Suite and Super Deluxe 4 Bedded to choose from. The rooms are very spacious and have a very vibrant aura that makes you feel that you are in your home rather. There are private balconies and sitting area outside rooms that offer a unique and mesmerizing vista of the buzzing town. All these facilities make it a wonderful place to stay while you spend your vacations in Katra. Dining There is an in-house restaurant called the Aroma Restaurant that follows the tradition and culture of Vaishnodevi and serves pure vegetarian food. They have an adored list of delicacies that serve Indian, Continental and Chinese in an ambience that is refreshing and rejuvenating. Apart from the above cuisines, they also serve the traditional lip smacking food of Jammu and Kashmir. There is also a 24 hour coffee shop called Terrace Coffee Shop that offers many aromatic flavored coffees as well as all types of snacks. The use of onion and garlic is omitted.